I spun up my copy of the UCSPE (obtainable here) and grabbed a few screenshots to provide a quick walkthrough. The customer was able to follow my instructions quickly and with no further follow-up questions, so I figured I’d toss this into a quick blog post for anyone else looking to do the same. Each 6200-series UCS Fabric Interconnect will have a single 4-member port-channel that goes up to the pair of Nexus using a vPC. 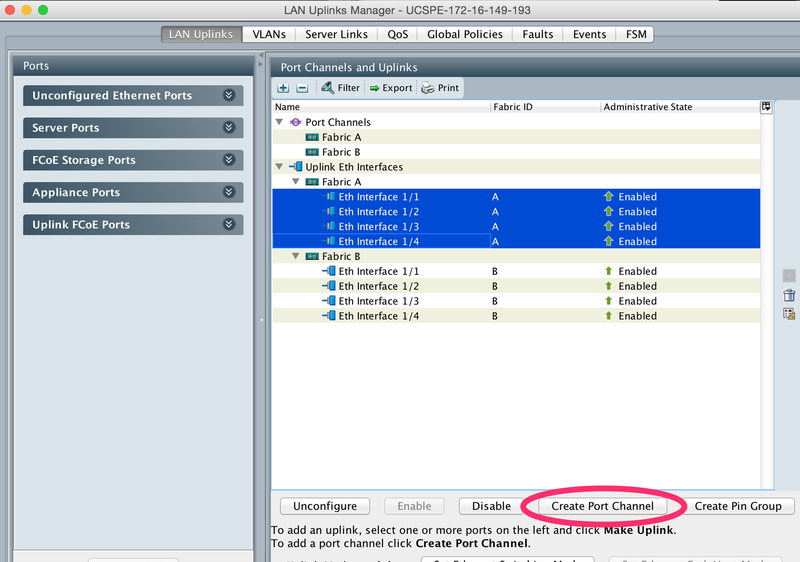 If the ports you are looking to port-channel already show up under the “Uplink Eth Interfaces” list of the main pane of the LAN Uplinks Manager, then the ports have already been assigned a personality. 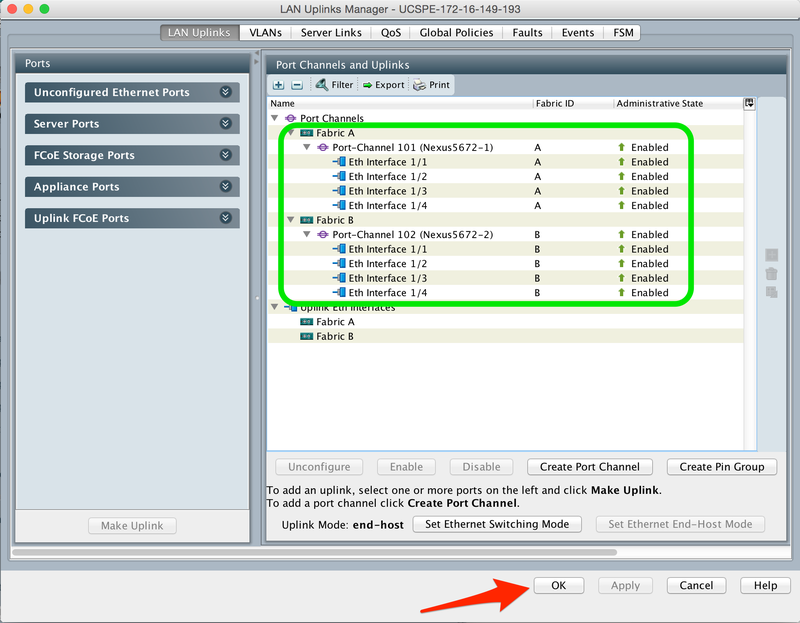 If not, then as shown above, you may need to expand “Unconfigured Ethernet Ports” in the left pane of the Uplinks Manager and select the appropriate phyiscal ports, right-click them, and select “Configure as Uplink Port.” They will then show up under the “Uplink Eth Interfaces” list in the main pane. Repeat this on Fabric Interconnect B. 4. Next, you will go through the port-channel wizard. You will select a port-channel ID. This can be any number you want. 100 for Fabric A and 200 for Fabric B or 10 and 20 or 101 and 102 are all common choices. You could make them match the Nexus-side config as well. The name is just a label field, make it anything you want (no spaces allowed, I don’t think). 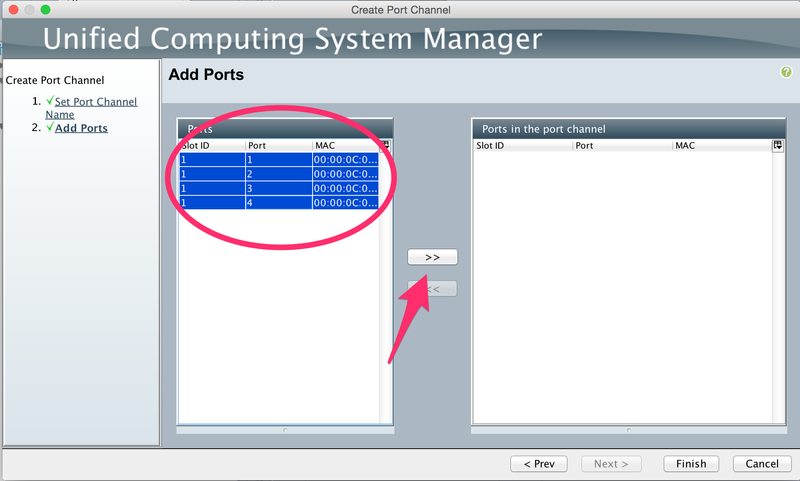 Hit “Next” and then select the 4 ports that should show up (or the 4 ports you’re assigning to the port-channel if more are available in the list). Hit the “>>” button to assign them to the port-channel, and hit “Finish“. When done the A fabric, do the same for Fabric B (starting with the “Create Port Channel” button again). 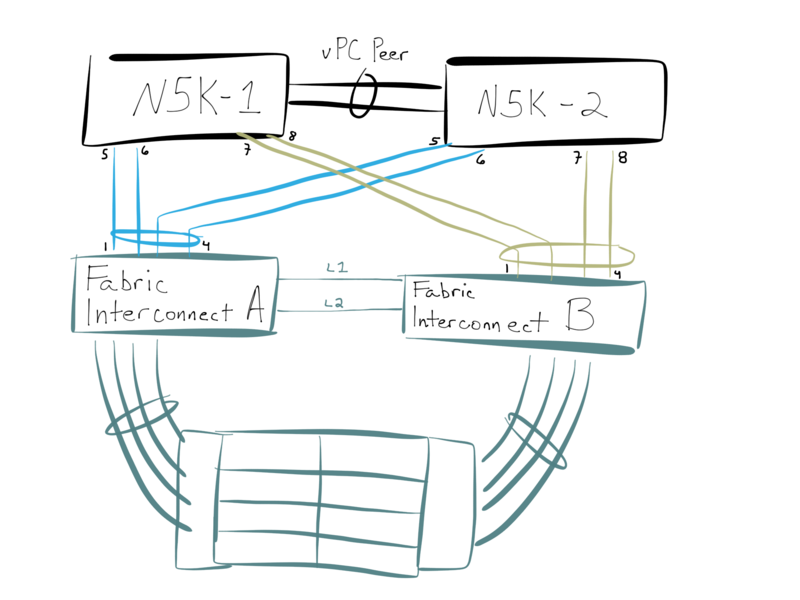 Hit the OK button, and then cable the links up based on the diagram, FI-A ports 1-4 to ports 5-6 of both Nexus, and FI-B ports 1-4 to ports 7-8 of both Nexus. 6. Check status of the port-channel from the Nexus side with “show port-channel summary” and/or “show vpc 5” and “show vpc 7”. If everything is up, you should be good to go. Quick question / comment on your design. Bear in mind, I’m coming at this from a view of a sysadmin and one with no blade experience. IMO, I would not want my links between the fabric interconnect and the nexus 5k spread across two switches. Meaning instead of having a vPC that ‘s spread across nexus a *and* b, I would prefer all 4 links go from a to a and from b to b. 1. You’re cutting the effective bandwidth in half or if nothing else adding an extra hop between the san and host uplinks. While its quite possible that the path of a packet may go from host > FIA > Nexus A > SAN link A, its also possible that the packet will need to go the following path hot > FIA >Nexus B > Nexus vPC > SAN link A. In a world where flash is being added to the SAN in hopes of adding performance, every hop counts IMO. 2. As mentioned before, the SAN have native link HA built in. if host link A can’t access SAN port A, host link B will still be working. So there’s not need to span switches. 3. The design i’m debating, would provide more predictable performance / outcomes. If anything in “a” dies, then the A side is down and everything fails over to the b side. 4. Things like vMotion have similar design clauses, although not as big of a deal. 5. Most servers now a days are natively able to aggregate links, so why not put the redundancy back on them? The only issue that I can see which might occur, is if either the FI or nexus becoming a black hole in the event that its parent switch goes down or vice versa. Then again, I’d like to think perhaps inter nexus vPC could help with that (perhaps I’m wrong). What are your thoughts? Hopefully I outlined my concern well enough. Anyway, your concern has some validity and to be sure Cisco’s recommendation if the upstream switch is not MLAG/vPC capable is to do just as you suggest: FI-A to upstream switch A, and B-to-B. The benefit of using a vPC or MLAG when possible is avoiding a disruption in the fabric in event of a failure on the upstream switch. In the A-to-A/B-to-B model, if the upstream switch fails, you have a fabric failover on your hands. That *should* work fine, but it still means fate is shared between two devices that don’t really have any tight coupling, and you’re hoping that everything happens correctly. It also means that an upstream device failure has removed redundancy within the UCS environment — this is what I mean by fate-sharing, but I wanted to specifically highlight the impact. In the MLAG model, a failure of the upstream switch reduces bandwidth across the board (as you recognized) but does not cause a fabric failover. Is this definitely better? Well, it very much depends on your situation and there are few “rights” and “wrongs” in design but generally avoiding a fabric failover is desirable, and avoiding unnecessary fate-sharing is also highly desirable. However, the A-to-A model is a valid design and if you feel that is better for your environment and would rather endure the chain-reaction failover in exchange for full bandwidth on a single fabric I don’t think anyone would tell you your design is “wrong” just because you did that despite MLAG being an option. Briefly to your other comments, yes vMotion is very much something that should be considered here. You want to avoid a vMotion from blade 1 to blade 2 in the same chassis traversing the upstream switch. Usually you want to set the vMotion vSwitch up with explicit failover order (not an active/active distribution) and have them all prefer one fabric. 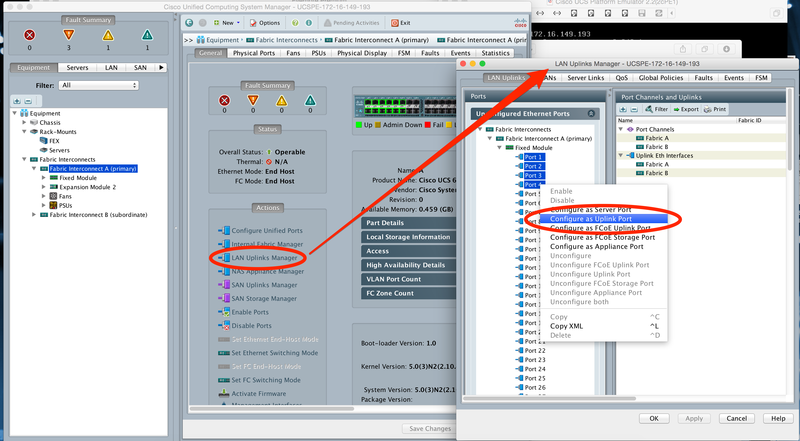 I’ve also seen a recipe where only one vMotion vNIC is created on the UCS and fabric failover at the UCS layer is associated with it, to remove the decision from vSphere and guarantee that in any given chassis all vSphere hosts are using the same fabric at the same time. I’ve never implemented that method, but it’s interesting to me. Finally, your question about the storage connection optimality (comments #1,2): The vast majority of UCS installs I work on are a FlexPod style architecture (since I work at a FlexPod Premier Partner!) and in that case we always vPC both NetApp controller heads into both Nexus switches, so both your SAN controllers are linked to both Nexus. The vPC rules state that you will never cross the vPC peer-link if both “sides” of the vPC are up, and so that suboptimal case you refer to will never happen unless a link to a SAN head is down. If FI-A hashes onto the link to Nexus B, then Nexus B will switch the frame out to its local vPC member link to SAN head A if that’s what is needed. If we’re talking an FC environment then then this is all out the window and you definitely do NOT cross-connect the FIs to the alternate SAN fabric switches. Hope all this helps. If you ever need any assistance with your UCS environment, feel free to reach out. We’d love to work with you. Thank you so much for putting this together. I am new to UCS and still learning. I was able to follow your instructions without any issue.